I ate a bowl of blueberries the other morning, and while a bowl of blueberries is always welcome, it also reminded me why I take the trouble to head up into the mountains and spend a day picking huckleberries. The domesticated blue ain't got nothing over a wild huck. Just saying. 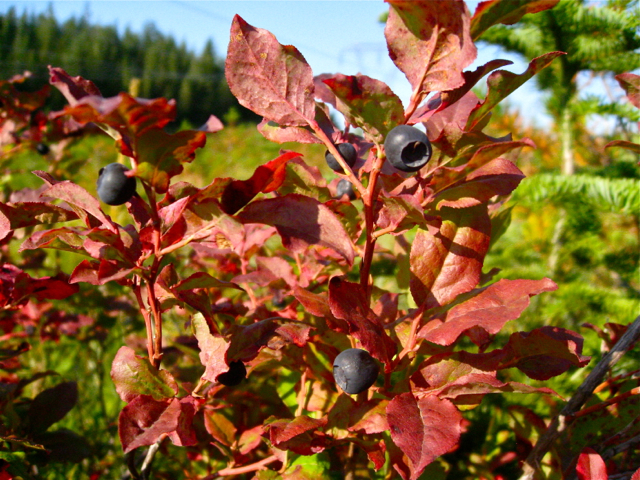 This year isn't looking like a banner huckleberry harvest in the North Cascades, but anything is better than last year. Last year the bears got into all kinds of trouble in town because the huckleberry crop failed so miserably. This year the bears should be a little more content. At least my go-to spot had ripe berries on the bush the other day, if not good quantities. Last year the only reason to go huckleberrying was to find porcini under the bushes. Per usual, I spread the hucks on cookie sheets and popped them into the freezer for a couple hours. Once the berries were frozen I scraped them into freezer bags. This way we can reach into a bag and grab a handful whenever the need strikes. This need strikes my daughter quite frequently. She's a huckleberry fiend, so I need to get back up into the mountains soon or she's liable to get ornery. You don't want an ornery huckleberry-hankering six-year-old at home. It's like having a bear loose in the house. You have never said truer words. 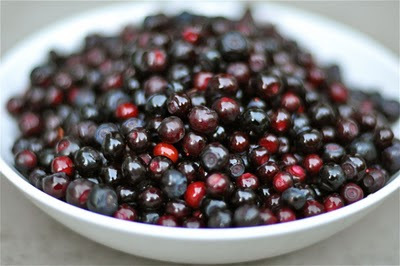 I look forward to a fall trip, weather permitting (and often not), into the Northern Cascades for some high-mountain huckleberries. I always bring a bit of bacon and some pancake mix. Best breakfast ever. Gabriel - This is the best time to be in the mountains for an extended backpack. Mushrooms, berries, fat trout... And not so many daytrippers. Hope your excursion is bountiful. Megan - Love that area. High plateaus with miles of easy walking through the huckleberry patch. Haven't been there in a few years. Might be time for a return trip. Good luck with the berries. I also have found the hucks aren't very sweet this year - last week on Pilchuck, while some of the blue variety were plump and ripe, they weren't very sweet. Same for some reds that I encountered over on Bainbridge a few days later. But still. More character than the domestics! We had a good early season on the hucks here in Sandpoint but the later high mountain ones just don't have the quantity. but on a better note the raspberries, blackberries, and Eldar berries are loaded! We have also got pretty heavy into Lobster mushrooms and a few Chantrelles. I just got back from being away for a few weeks and was trying to find out if the huckleberries were worth a trip up to the mountains this year. Glad you're blogging about berry picking! Hope they're still decent this weekend.